We had many alternatives, which held various attractions and advantages, and we considered them all. In the end, though, we decided that this was the best way to get a reasonably complete and enjoyable first release of Forgotten Hope 2 into your hands, as quickly as possible. Some of you may feel disappointed that your favorite theater or army won�t be in the first release, but rest assured, this is only a beginning. We will be expanding the mod to all of the theaters it currently occupies, and more, in the course of time. On the topic of making our first release, we are looking to expand our team of developers. We are particularly looking for people to work on sound, animation, and skinning but we will consider talented people in other areas, as well. A mature attitude is as important as modding ability�applicants should be able to work as part of a team, to give and accept criticism, and to pay attention to detail in all their work. Be prepared to provide examples of previous work, and to undertake a test project. Contact ArminAce at arminace@aol.com for more details. Moving on, we know you won't be satisfied without a glimpse of some of the goodies you will be seeing in FH2. We aren't ready to show you our player models yet, but Zero has prepared a tiny taste of things to come. His German tropical helmet is a auspicious indication of just what can be expected for FH2. 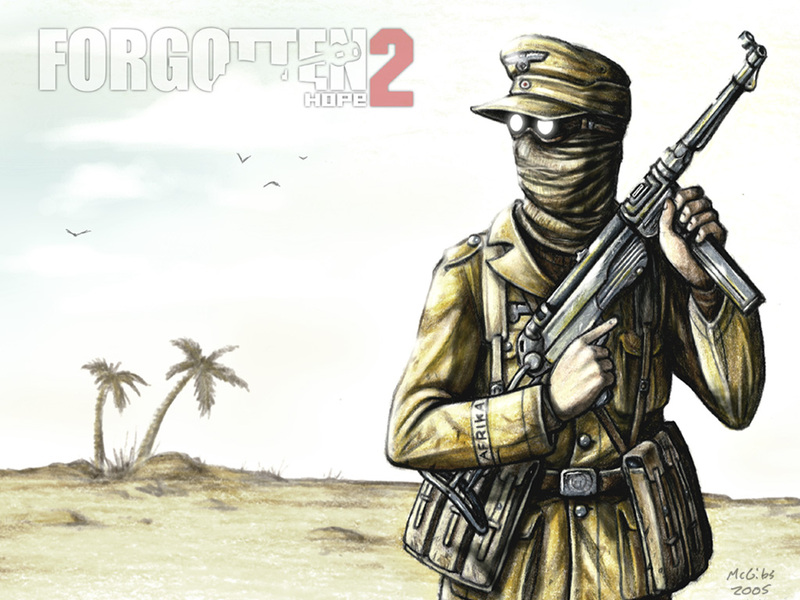 Next up is a new version of the K�belwagen in the colors of the Africa Korps. Many k�bels sent to the troops in North Africa had special low pressure tires for the sandy terrain, based on aircraft tire designs. 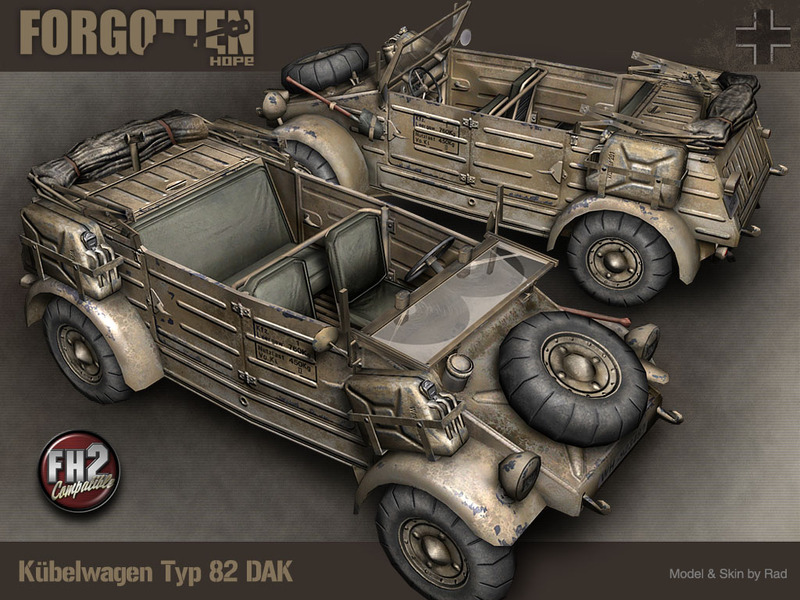 Besides the special tropical tires, Rad also created a unique equipment loadout for his DAK k�bel . One recent source of griping on the forums has been the absence in our news of any Panzer IIIs skinned for North Africa. We didn't forget them, we were just waiting for a special occasion to bring them out. 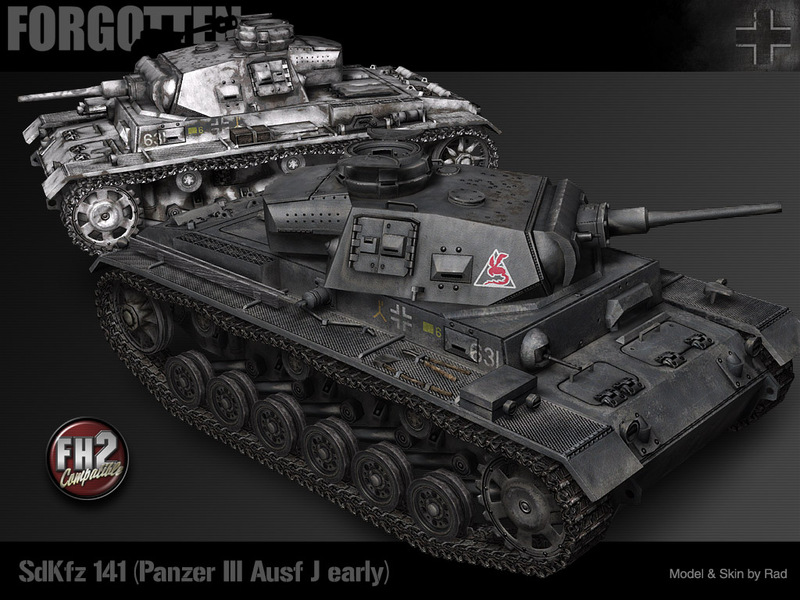 The African versions of the Panzer III Ausf J, M and N were modeled and skinned by Rad. That's all for this week, but be sure to come next week when we present a preview of the opposing British forces. Until then, feel free to visit our public forums to discuss this update and other news. Welcome back for another Forgotten Hope news update. 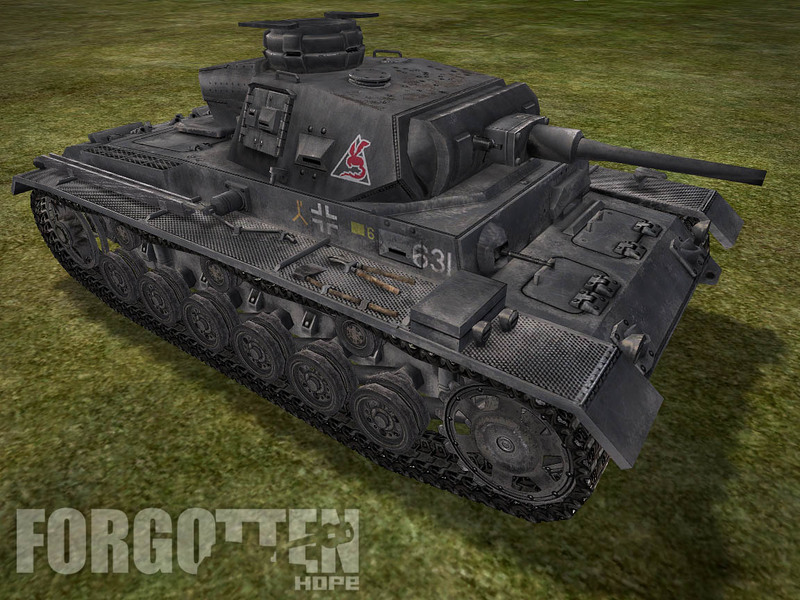 This one is devoted to revisiting some familiar faces that will get a fresh new look for Forgotten Hope 0.7. Some of these, of course, will also be showing up in FH2, even if they don't have an FH2 Compatible logo yet. Before I get to the new things for the mod, we want to thank Adamward and Rogue of Macologist.org for their efforts in bringing Forgotten Hope, as well as many other mods, to the Macintosh game community. 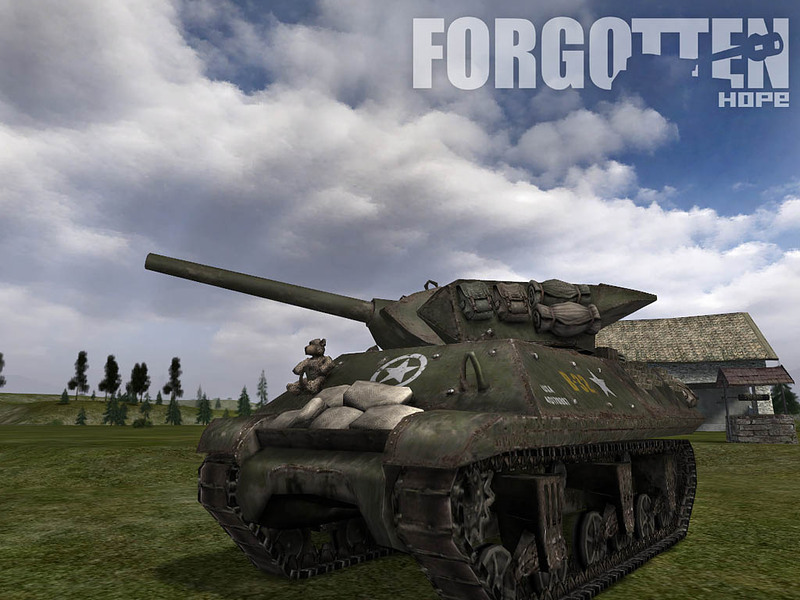 The initial port of BF1942 for the Macintosh was unable to support the heavy demands made by some of the largest mods, including FH. The folks at Macologist.org were able to help game publisher Aspyr identify the bug and test a patch, which seems to have been very successful. More details about the patch are available here, and FH 0.67a for the Macintosh can be downloaded here. Starting off our second looks, we have a major remake of the Bren Mk I, the primary LMG used by British, as well as many Commnwealth forces during WWII. The Bren was based on the Czech ZB vz.26 LMG with modifications to accept a .303 rimmed round, and the appropriate magazine. Reliable and accurate, the Bren was popular with British troops, despite its weight and comparatively low rate of fire. 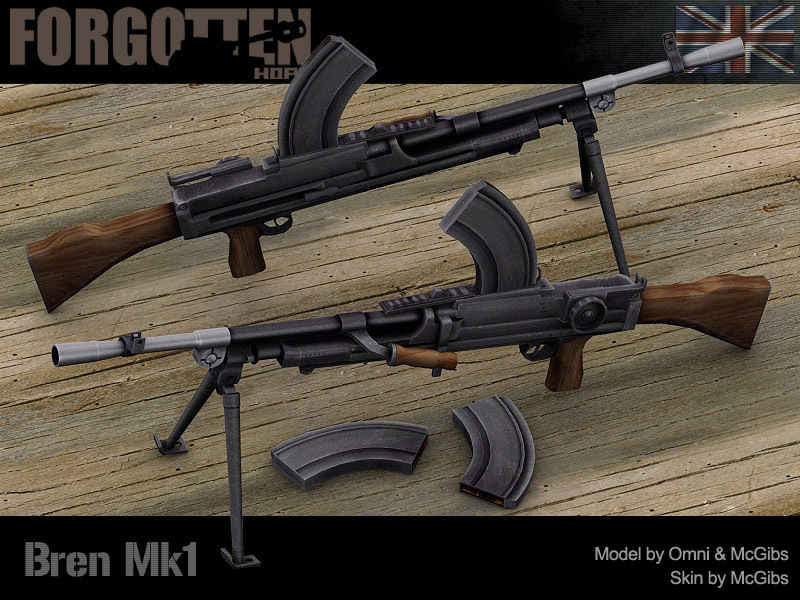 The new FH Bren was modeled and skinned by McGibs, based on the original model by Omni. Rad has also been giving attention to some old familiar faces. The M10 Tank destroyer and the M8 Greyhound both carry the extra baggage and equipment that Allied crews tended to accumulate during a campaign. In addition Rad gave the Greyhound a new turret interior and new wheels, as well as improving the skin. That's all for this week. Be sure to check back next week for another update, and, in the meantime, feel free to visit our public forums to discuss this update and other news. Welcome to another Forgotten Hope news update! 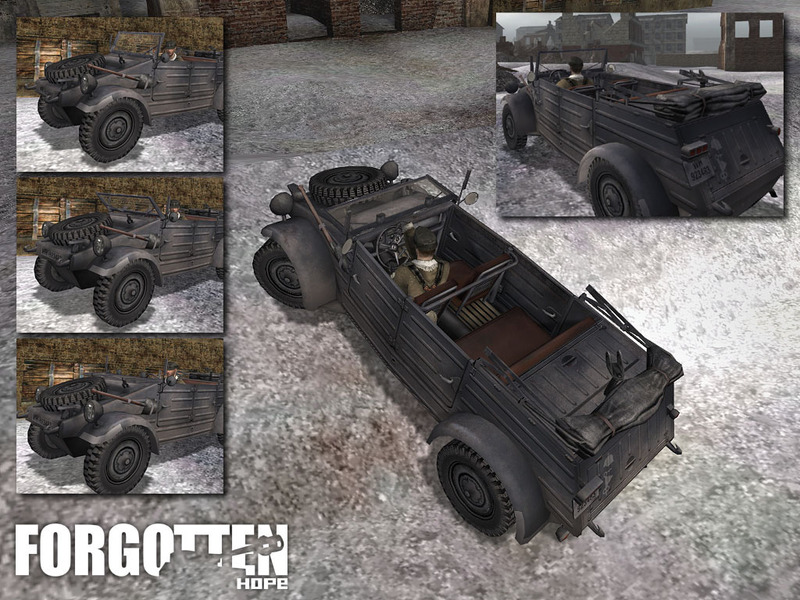 Today, we have a change of pace from the vehicles we have been featuring in the last few updates. Instead we will focus on an assortment of interesting tools for the ground pounders. Before I get to the goodies, I want to welcome ctz to the Forgotten Hope Development Team. ctz will be joining HDN, Major Hartmann and Primo_Itch in the coding department. He has already coded several of the new weapons being featured in the update today. Lets give a warm welcome to our newest member! 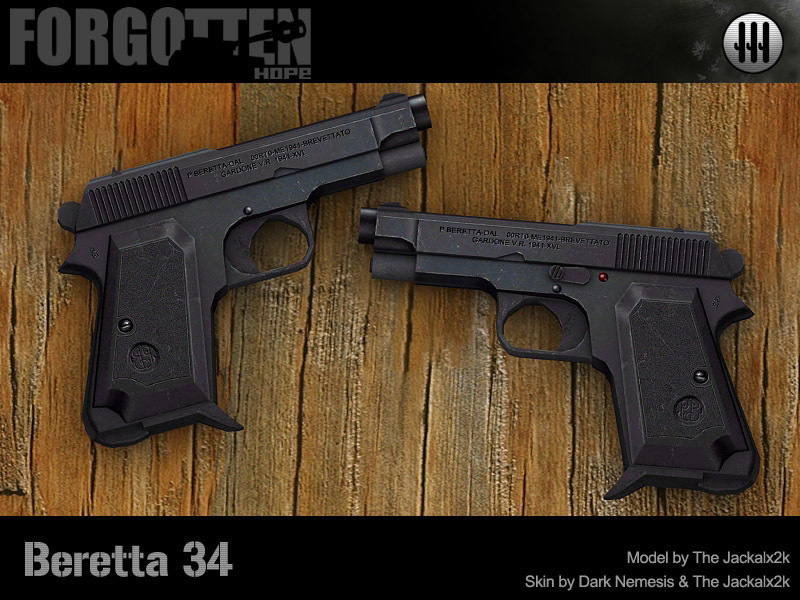 First on the list is the Beretta 34. The Beretta Model 34 was a standard sidearm of Italian officers in WWII. Light, compact and reliable, it was also popular with Allied soldiers lucky enought to capture one. The Beretta Model 1934 was modeled by The Jackalx2K and skinned by The Jackalx2K and special guest skinner Dark Nemesis. 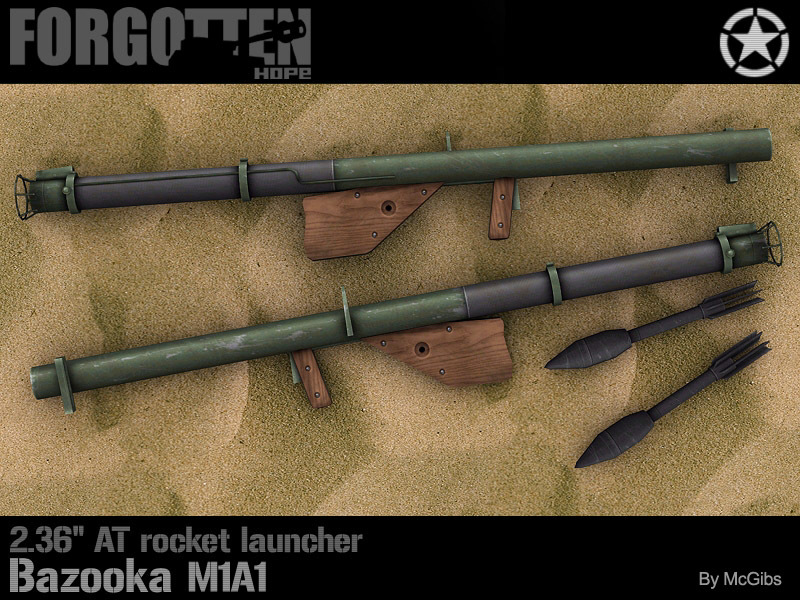 Next we have the M1A1 Bazooka, which was modeled and skinned by McGibs. Named for a home-made musical instrument popularized by American radio comedian Bob Burns, the Bazooka was developed by the U.S. Army in 1941. It was an extremely simple but effective design that delivered a rocket-propelled, shaped-charge round through a steel tube. Although created almost as an afterthought during an effort to develop an antitank rifle, the army dropped its original plans and embraced the new weapon, after a demonstration by designer Col. Leslie Skinner. 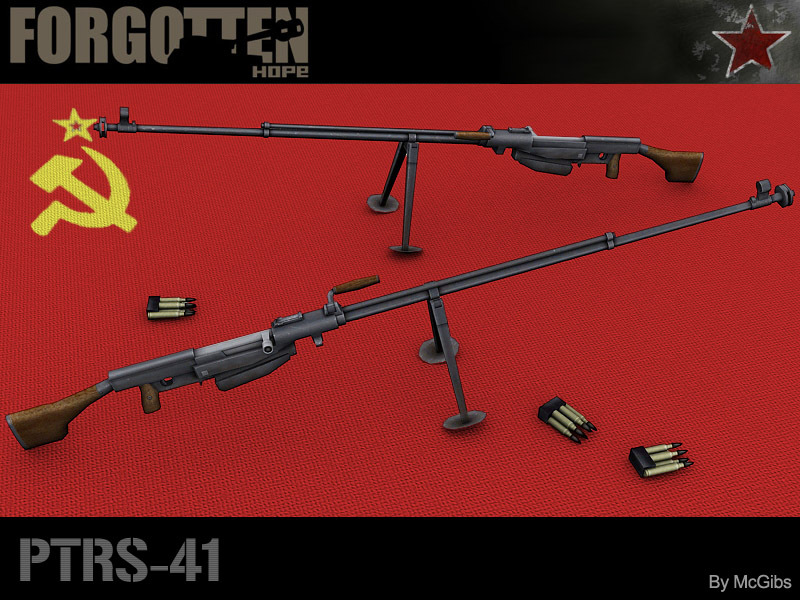 The busy McGibs has also created a new antitank weapon for the Red army--the PTRS-41. Less common than the simpler PTRD, the PTRS was still fielded in large numbers, and estimated 400,000 being produced during the war. Both weapons used the same ammunition and had similar penetration characteristics, but the semi-automatic PTRS could deliver a much higher rate of fire than the bolt action PTRD. 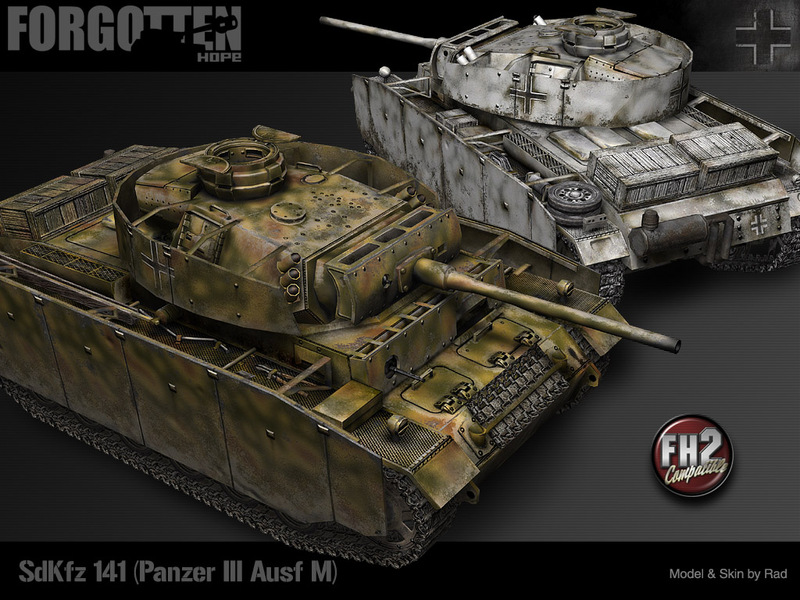 In case you were wondering whether the stylish Panzer III renders we showed off last week might be a misleading guide to how it really looks, here are a couple of screens that prove otherwise. 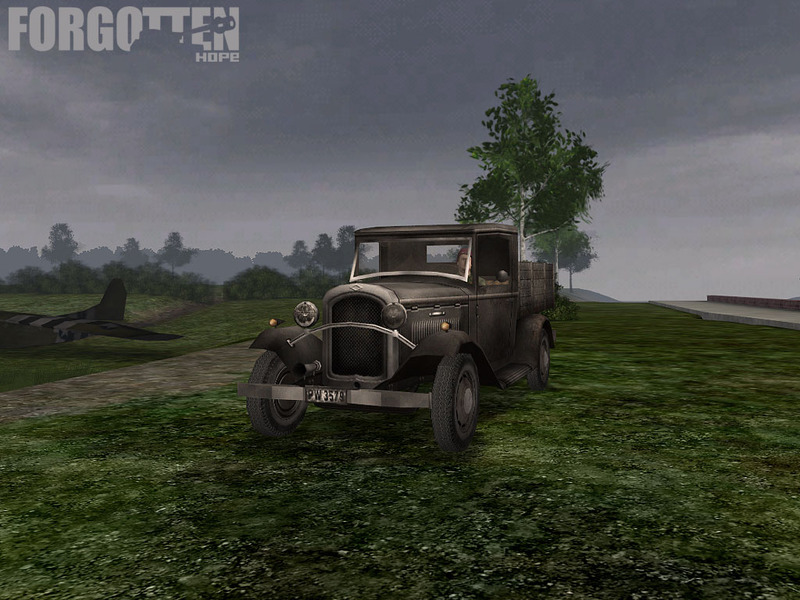 Seeing how they already look in BF1942, we can't wait to see how they turn out in the BF2 engine. That's it for today's update. 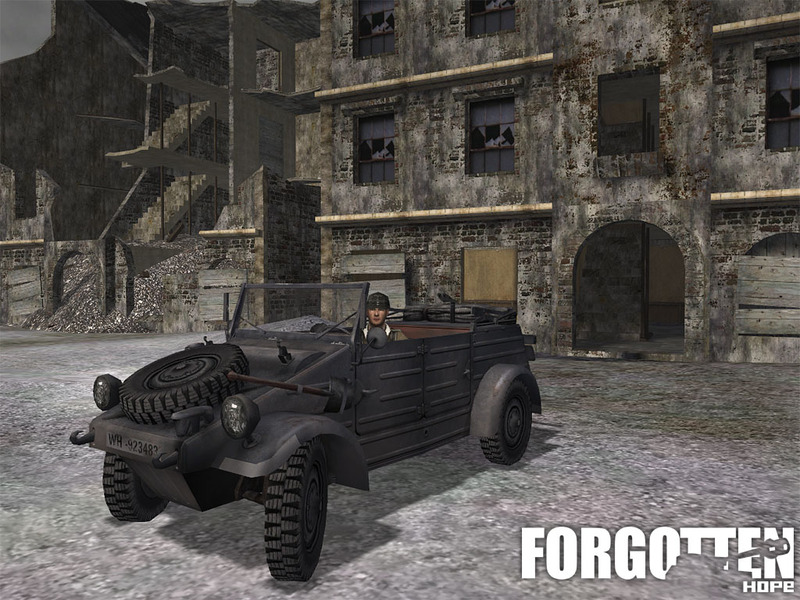 Feel welcome to visit our public forums to discuss this and other issues of the Forgotten Hope mod. Welcome back for a special Forgotten Hope community news bullletin. Starting on July 17th, Wolfgaming.net will be hosting Fan map Pack #5 on their regular FH server at 65.206.113.131:14567. Fan maps sometimes don't get the attention they deserve, so this is a special opportunity to check out these cool maps on a busy, well run server. You can download these maps from links on this page. That's all for today, but be sure to check back again next Sunday for a regular Forgotten Hope news update. Visit our public forums to discuss this and other news updates! 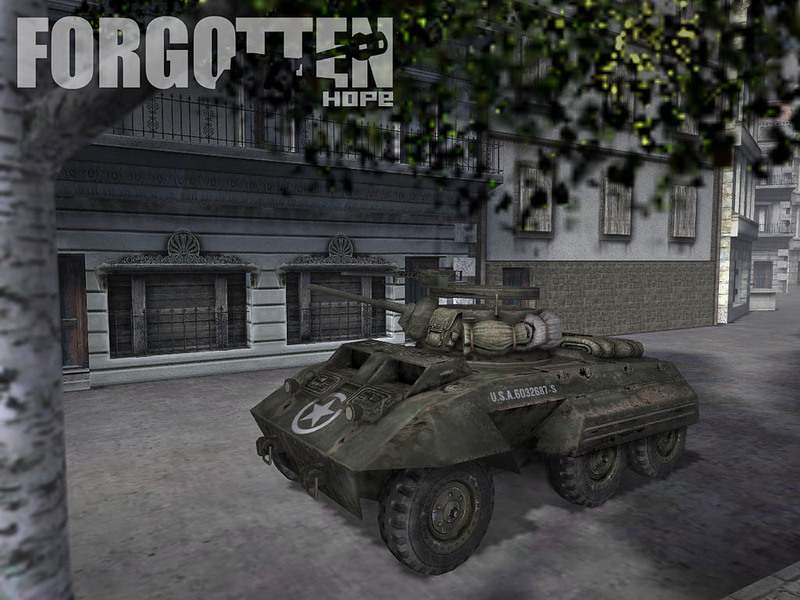 Welcome back for this weeks update of Forgotten Hope. I am happy to be able to show you the first images of the long awaited Panzerkampfwagen III. 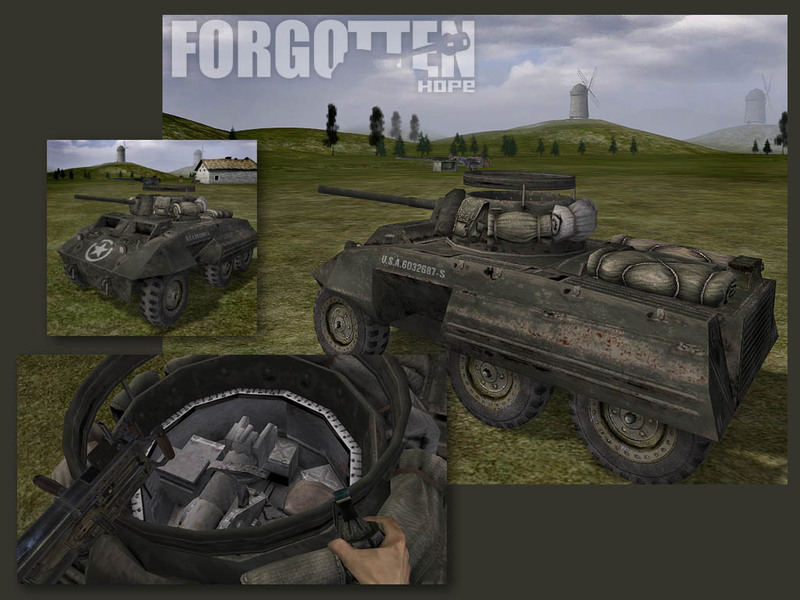 These will get their first taste of combat in Forgotten Hope 0.7 for Battlefield 1942, but as you can see, they will also be available for the first release of Forgotten Hope 2. After encountering heavily armed T34 and KV tanks during operation Barbarossa, it became apparent that the Panzer III, as Germany's main tank killing vehicle, was dangerously vulnerable. 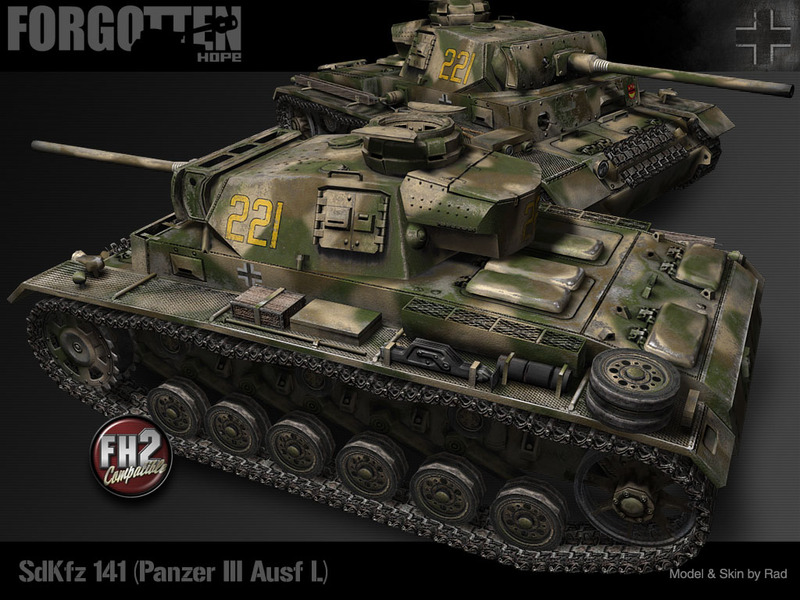 The Panzer III Ausf L, first produced in 1942, represented an attempt to improve the survivability of the Panzer III. Armor thickness was increased from 30mm to 50mm on the front turret and 20mm spaced armor was added to the front hull and mantlet. Some were also given schurzen for added protection. Other improvements included modifications intended to keep the engine running smoothly in extreme environments and simplifications to speed up production. 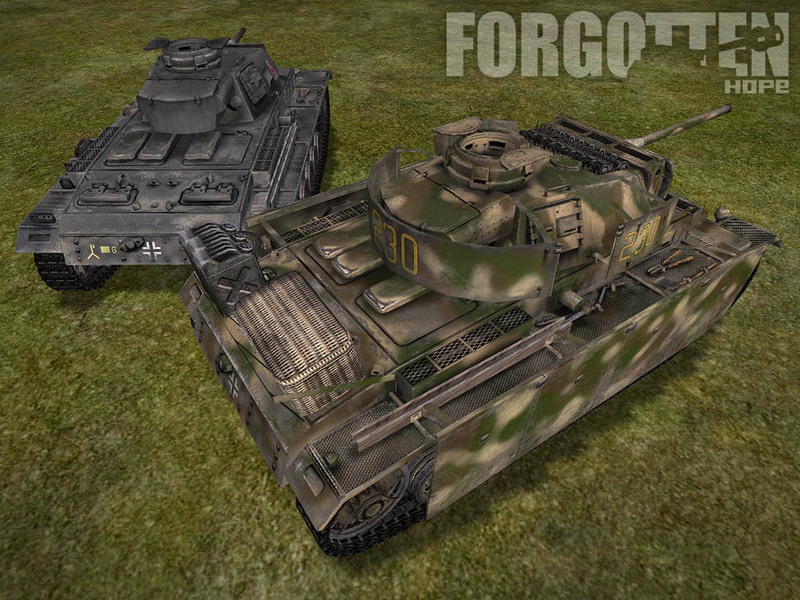 The Panzer III Ausf L was modeled and skinned by Rad. 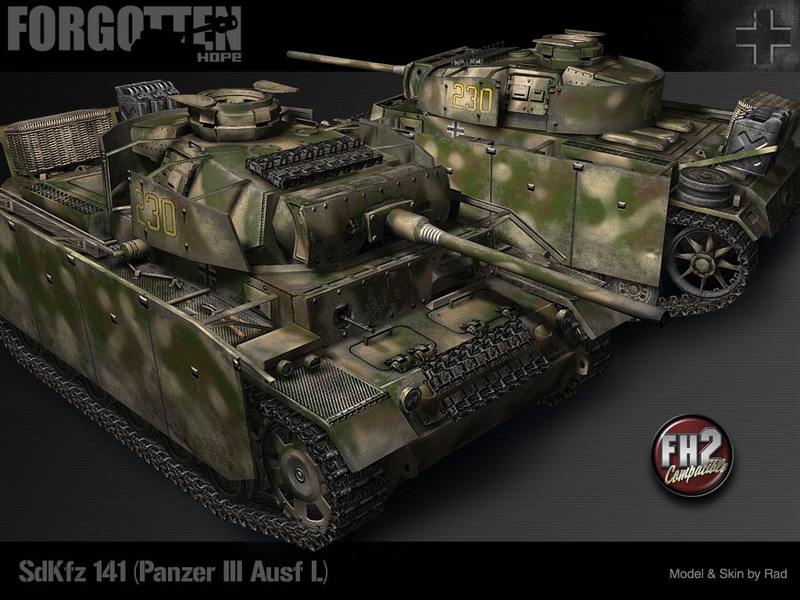 The Panzer III Ausf M, manufactured in Late 1942-early 1943, was the last version of the Panzer III was intended for the role of fighting other tanks. Similar to the Ausf L in its armament and protection, the Ausf M was equipped for wading rivers that were too deep for earlier versions. Ausf Ms were factory-equipped with schurzen. 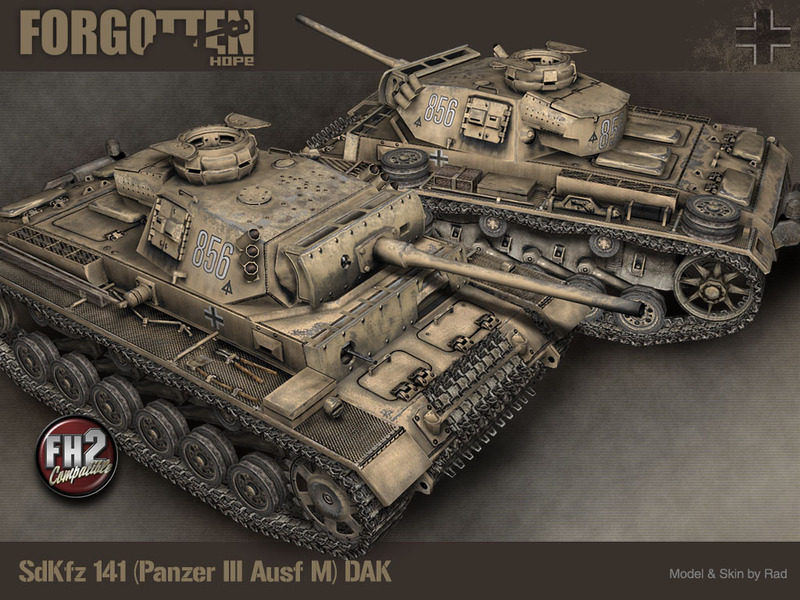 The Panzer III Ausf M was modeled and skinned by Rad. 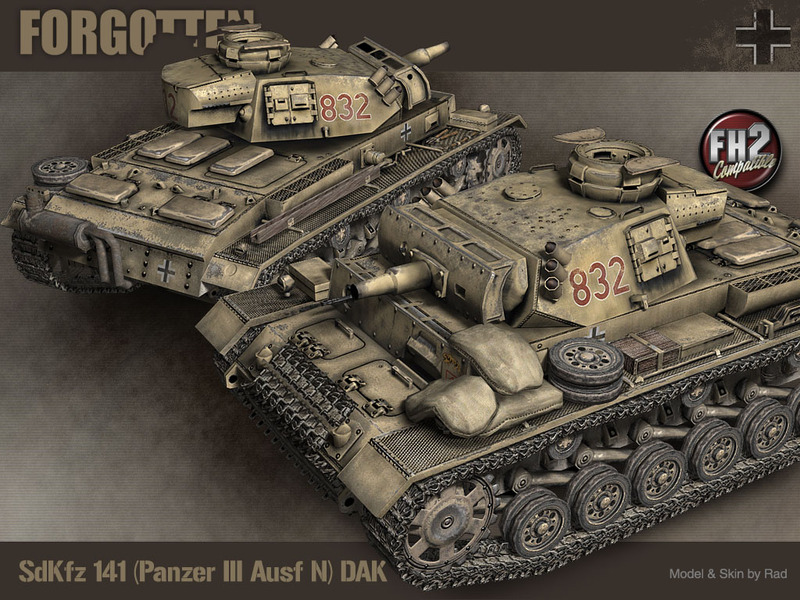 The Ausf N was the last Panzer III produced. 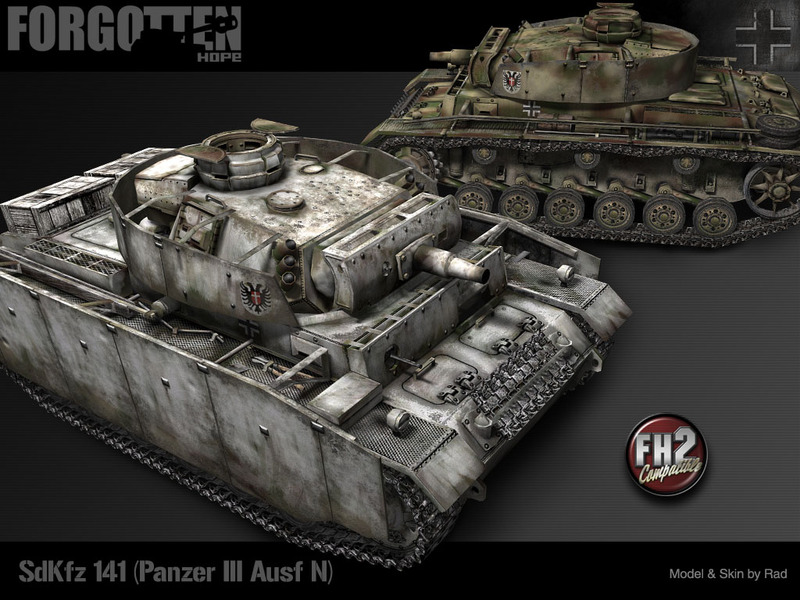 Equipped with the same 75mm KwK 37 L/24 used in the early Panzer IVs,the Ausf N was intended for infantry support, as by this time, the Panzer III's tank fighting role had been superseded by other vehicles. 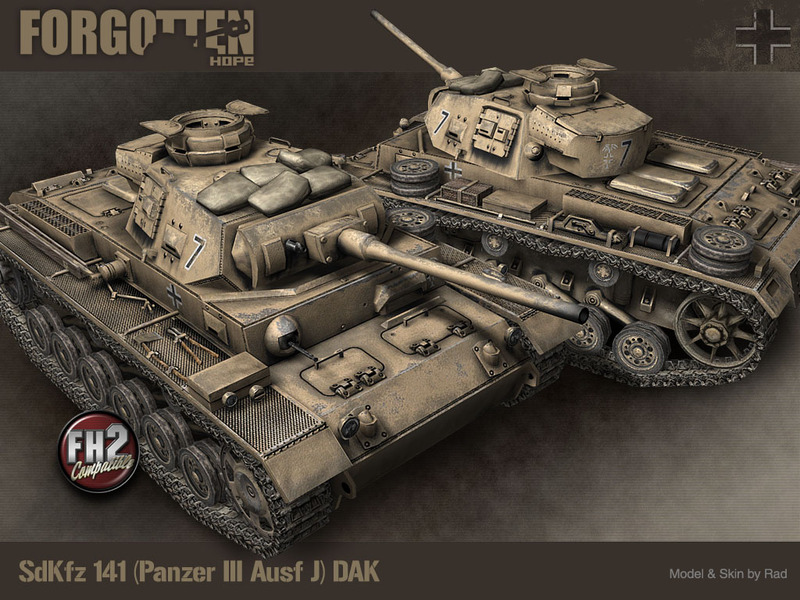 The Panzer III Ausf M was modeled and skinned by Rad. That's all for today, but be sure to stop by our public forums to discuss this and other news updates! Hello and welcome to another update of the Forgotten Hope Mod. Sorry that we missed an update last week, we are all spoiled from having Bug$ take care of this task for us. To make up for it, we have some extra goodies for you to look at today. First of all, Forgotten Hope is participating in another Topsite Listing, this time one being run by frag4fun.com. A link for this and for Doomlab's list have been added to the left hand side of the page. You don't actually need to click either of them to add to Forgotten Hope's site score, it registers automatically once a day, the first time you visit our homepage (the one you are reading right now). 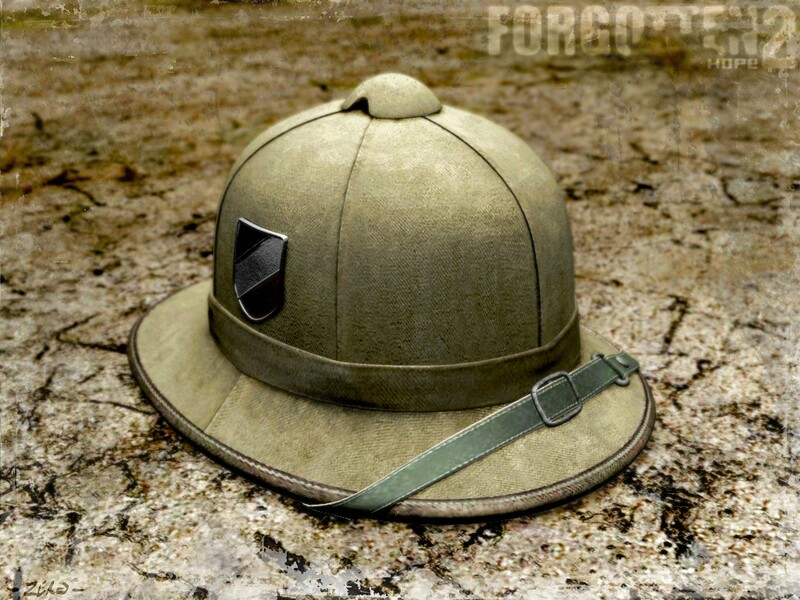 But, by visiting the toplist sites, you can rate Forgotten Hope, post comments and check out a lot of other BF2 sites, but it does not affect the FH site ranking. If you do decide to visit, please be considerate of the other mods and pages--it just makes us look bad to have negative remarks about other mods and sites, connected with FH. 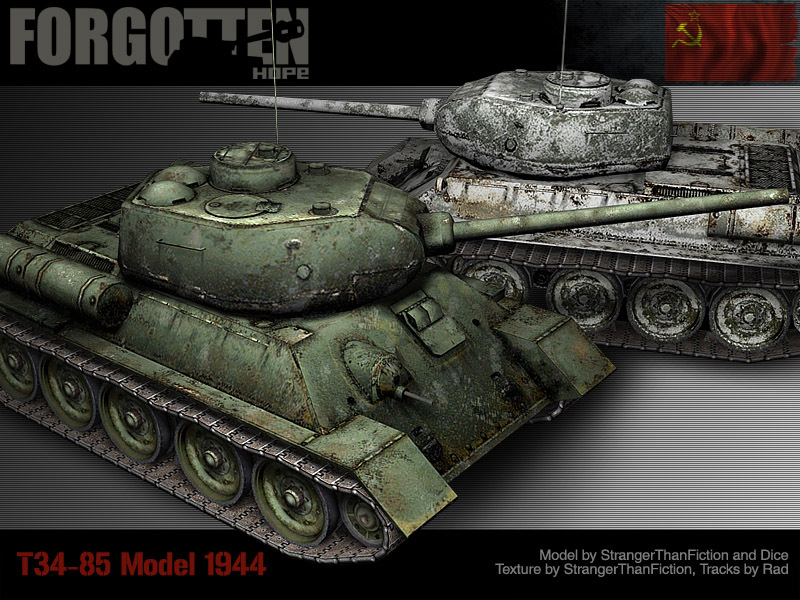 Getting to the actual new stuff, first we have a reskin and remodel of the the T34-76 Model 1941. This was unquestionably the best all around tank at the beginning of the war and is one of the most influential tank designs of all time. Its balanced combination of mobility, protection and firepower made it a uniquely formidable weapon for its time. Although T34s were only available in relatively small numbers to resist the 1941 invasion, by 1943, T34s made up over 50% of the entire Soviet Tank force. 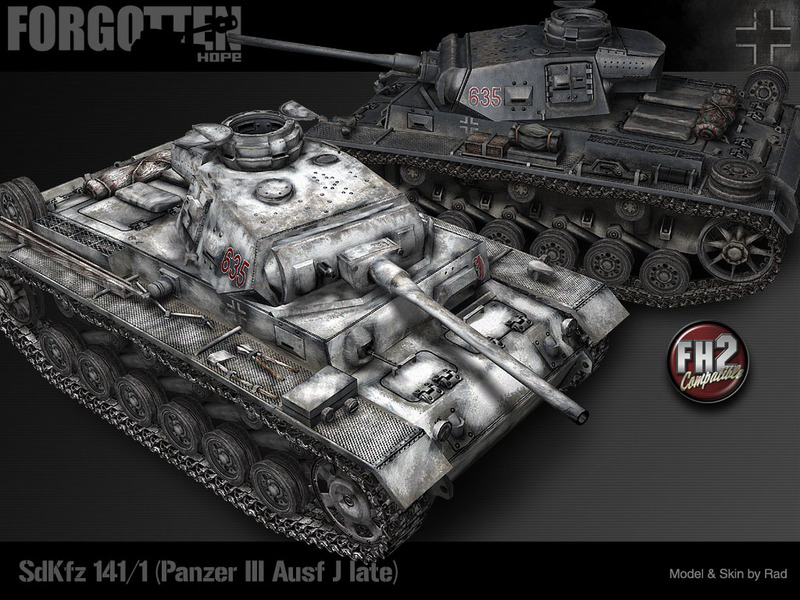 The new FH T34-76 is based on the current FH T34 with a turret modeled by Master Minder, and based on the original DICE hull. StrangerThanFiction revised the hull and (very slightly) the turret, and Rad modeled completely new wheels (some of you got an unauthorized preview of this, a few weeks ago). The skin is entirely new, with the tracks and wheels being by Rad, and everything else by StrangerThanFiction. The Heer was unprepared to deal with the T34 and had to revise existing armor tactics to deal with its superior qualities. Being both impressed and short on equipment, German armored troops were not slow to press captured T34s into service, as the Panzerkampfwagen T34 747(r). Crews were aware of the danger that their own troops might fire on them (a feeling familiar to anyone that has ever stolen an enemy vehicle in FH), and tended to paint on extra-large insignia to aid in recognition by friendly troops. 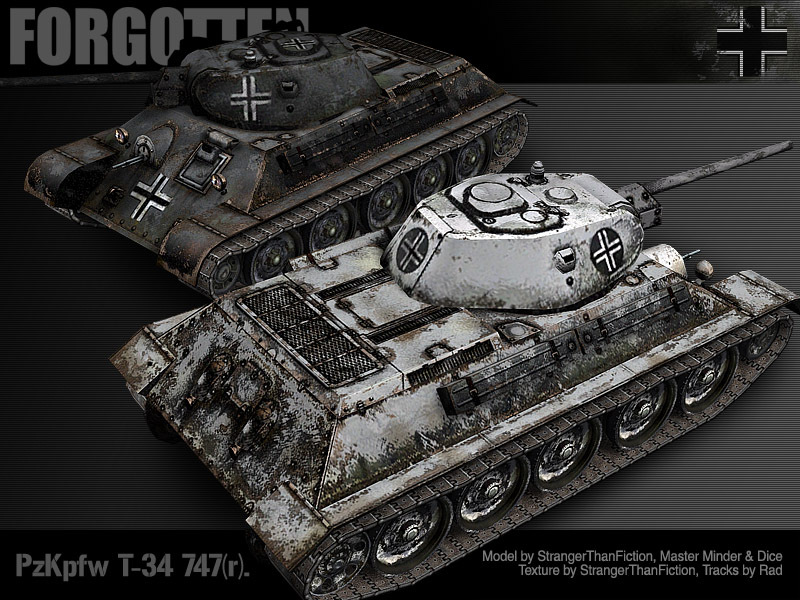 The PzKpfw T34 747(r)was created by Dice, Master Minder, Rad, and StrangerThanFiction. In late August of 1943 high ranking officials of the Soviet armaments industry discussed the difficulty that the T34s 76mm gun had in dealing with the new, heavier, German tanks that had appeared during the summer, especially during the heavy fighting at Kursk. They concluded that The T34 badly needed a more powerful gun to deal with these new threats. The new T34-85s, equipped with an 85mm gun, began to reach the troops in the winter of 1944. In addition to greater firepower, The T34-85 featured a roomier 3-man turret, that allowed the crews to fight more effectively. 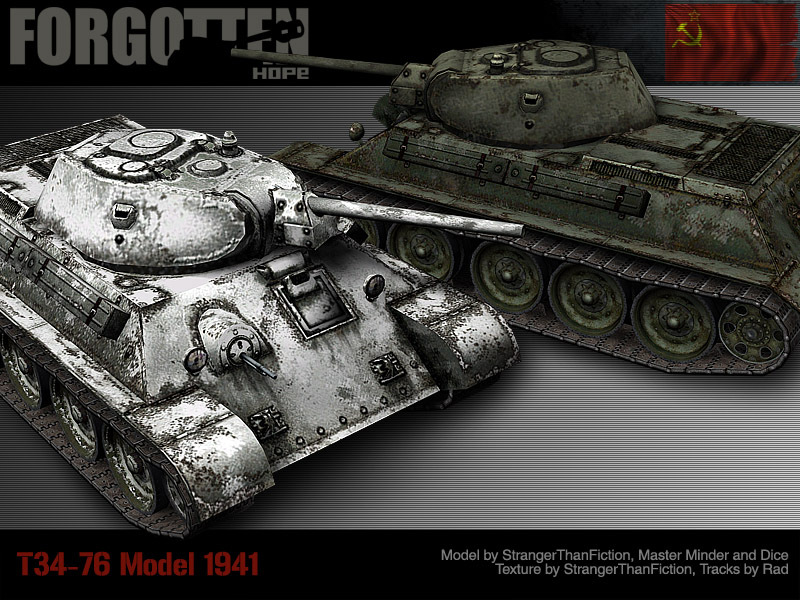 The T34-85 model is also based on a revised Dice hull with a new turret by StrangerThanFiction plus wheels by Rad. The skin is by Rad and StrangerThanFiction. 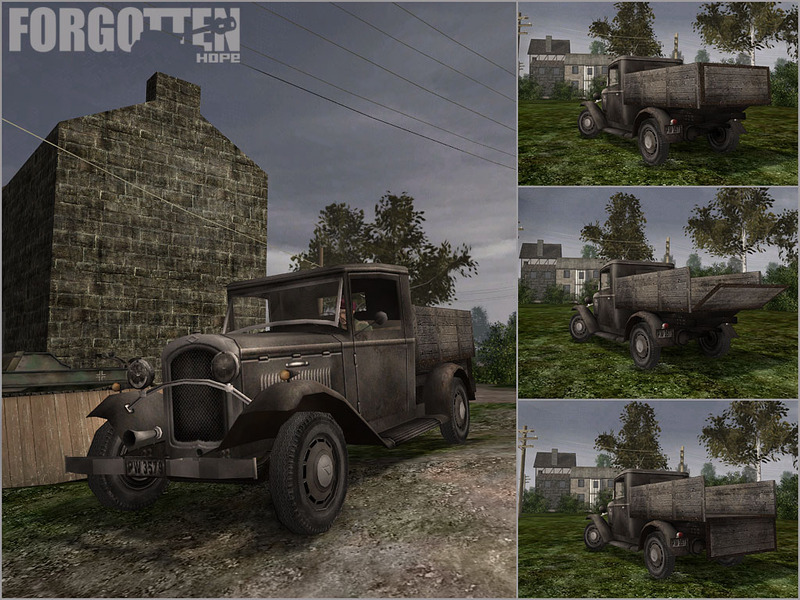 As a final treat we have some ingame screens of the Rad's new K�belwagen and Mange's civilian truck. These screens should lay to rest any fears that these will only look good in news renders. They will, of course, look even better in FH2.